If you've been following along with us for long, you know that I love to use every day items and recycled materials in play and learning activities. 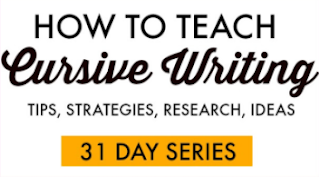 Today, I'm excited to share a free way to work on Visual Tracking Skills in kids. 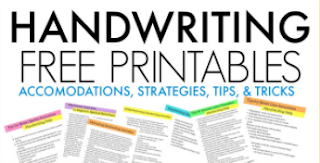 Recently, I wrote a post all about visual tracking skills in kids and why kiddos need them in handwriting and reading tasks. Today's post is a collection of creative ways to work on visual tracking using something you might just throw away-- cardboard paper tubes! Toilet paper tubes, paper towel tubes, and wrapping paper tubes are plentiful in a household and are usually just tossed into the recycle bin. 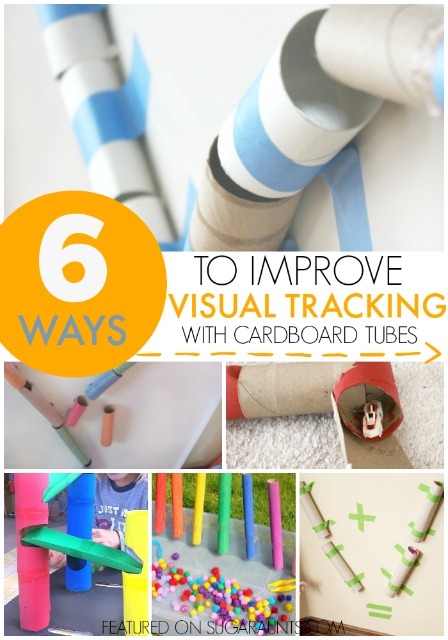 Start saving those cardboard tubes...these are fun ways to get those visual tracking skills going! 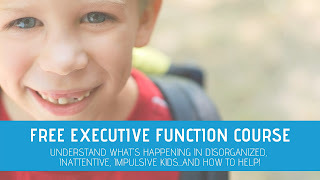 This post is part of my 31 Days of Occupational Therapy series where I'm sharing a month of inexpensive treatment materials for areas typically treated in Occupational Therapy. You don't want to miss this! Here is detailed and informative information on saccades and how they make a great impact on learning and reading. Some of you have voiced concerns about using toilet paper tubes in play and therapy. You can skip the toilet paper tubes if you like and stick to paper towel tubes and gift wrapping cardboard tubes. These can be cut down to the size you need. Or, try making your own cardboard tubes using recycled cardboard boxes like Hands On As We Grow did. Use these mazes, ball runs, drop toys, and movable toys in visual tracking with kids. Children can manipulate and build their own mazes while visually tracking a moving ball or other item. This is a great way to work on visually tracking an object as it passes through a child's field of vision. Hands On As We Grow uses math in their marble run activity. Use cardboard tubes to create a marble run, like Powerful Mothering did here. Add magnets to cardboard tubes to make movable tube ramps like Teach Preschool did. Building a marble run on the wall is a great way to explore engineering, gravity, and speed. Try this kid-made marble run tube activity from Little Bins for Little Hands. Inspiration Laboratories made a cardboard tube maze for hexbugs. How cool is that? Work on color sorting and fine motor skills in cardboard tube activities like The Imagination Tree did. Use brightly colored balls for the ball runs. Have races with different colored marbles or balls. Predict which ball will fall through the track faster. Make a ball run along a long wall, for more visual scanning and peripheral scanning. Ask your child to close their eyes. Start the ball in the ball run and tell them to open their eyes. They will need to locate the ball as it rolls through the maze. Write letters and numbers on the cardboard tubes. As the ball rolls past the letters/numbers, have your child call out the name. Give your child a flashlight and ask them to keep the light on the ball as it rolls through the maze. Other ideas to work on visual tracking is using a Marble Run in sensory play like we did with oobleck and waterbeads. 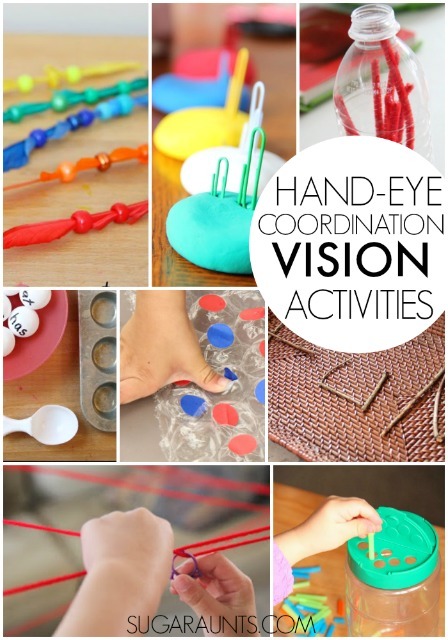 Like this activity and creative idea for working on visual tracking? 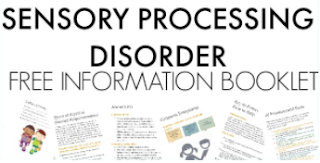 Stop by and look through our Visual Perception page where I've got a bunch of ideas to share.